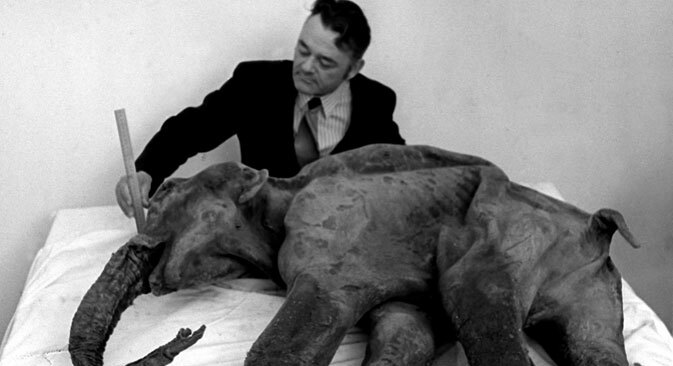 Russian scientists have begun work on resurrecting the mammoth. In September the International Center for the Study of Cells of Prehistoric Animals will open in Yakutia. In Yakutia, one of the northernmost regions of Russia, the International Center for the Collective Use of Molecular Paleontology for the Study of Cells of Prehistoric Animals will open in September as part of the Mammoth Resurrection project. The researchers have plenty of material to work with. Seventy-five percent of the world's known mammoth remains have been found in remote areas of Yakutia and every year the ice yields new ones. After the laboratory is upgraded with the necessary equipment for genetic research, the Russian research team will begin working to isolate DNA and clone mammoths. In 2012, the directors of the Lazarev Mammoth Museum of the Northeastern Federal University's Institute of Applied Ecology, and Soam, a Korean foundation for biotechnology research, agreed to cooperate on the Mammoth Resurrection project. According to Semyon Grigoriev, the Head of the Museum, the International Center was established as a joint Yakut-Korean laboratory. The Korean partners have purchased several million dollars' worth of equipment, and Northeastern Federal University has provided and upgraded space for the researchers to conduct their work. Russian scientists have been studying mammoth DNA for years, yet it was only in 2013 that the Museum sent its employees to South Korea to learn cloning methods. Mammoths found in northern Russia that are unsuitable for study or exhibition are returned to the people that found them. However, most of the finds are a genuine goldmine for genetic scientists. "You need well-preserved stem cells to clone a mammoth,” says Valery Ilinsky, Scientific Director of Genotek Center. He explained that as there are no living mammoths left, the main difficulty is locating cells for standard cloning procedures. “The process is basically taking out the core of the original cell and transplanting it into the nucleus of the egg cell of another organism," he continues. "The main obstacle to cloning a mammoth is the small amount or absence of cells with a preserved core." The Center for the Collective Use of Molecular Paleontology was created to accelerate the cloning process. Scientists will be able to conduct research in Russia without having to transfer the material to foreign colleagues. Transporting genetic material abroad is a complex bureaucratic procedure. Russian experts began working on resurrecting the mammoth long before the Center was set to open. The best-preserved remains of the Malolyahovsky mammoth have already been transferred to Korean scientists. Results of the genetic study of this animal will be made public at the opening ceremony of the Center. Additionally, this summer from July 21 to August 16 an international expedition was made to northern Yakutia. Scientists reached another mammoth discovered last year near a river. The partially thawed carcass was examined, but it was too large to move and was found in a remote location. So the scientists only took part of the remains with them such as a foot and wool from the mammoth. They will soon be delivered to Yakutsk, where the expedition has already brought about 700 kilograms of paleontological materials. The mammoth has become a kind of mascot for Russia. A significant amount of this animal’s remains can be found there. Mammoth tusks and bones found by locals are on display at small museums in the Moscow Region, Caucasus and Siberia. The genetic map of the mammoth has already been created. It can be compared with the chromosome of the Asian elephant. After that, changes will be made to the elephant's chromosome and a live mammoth chromosome will be created. The resulting material will be implanted into an elephant’s egg cell for subsequent fertilization. If the experiment is successful, the researchers plan to settle the mammoths in Siberia. But some members of the scientific community in Russia consider the idea unrealistic. "These experiments have not been carried out anywhere in the world,” says Svetlana Borinskaya, a geneticist and biotech expert at the Institute of General Genetics. “Yes, bacteria has been cloned, but bacteria is not a mammoth. At this stage of science all comments on such a complex project boil down to ‘technically unfeasible.’ If you do it with known methods, there will be a huge number of genetic errors that are incompatible with the life of the animal."